It’s official, season three of Amazon’s “Transparent” is scheduled to drop Sept. 23. As the show’s new trailer reflects, the Emmy and Golden Globe Award-winning series continues its focus on a nuclear family whose patriarch, played by Jeffrey Tambor, has revealed his preference for wearing women’s clothes. According to Amazon, the upcoming season has Maura Pfefferman (Tambor) exploring gender confirmation surgery. The nuclear family “splinters into disparate journeys” as they continue their respective paths of self discovery. Now that Maura has found love with Vicki (Anjelica Huston), she is emboldened to seek surgery to make herself feel prettier. Shelly relishes in her newfound love with Buzzy and finally discovers her voice – she’s going to tell her side of the story whether her family likes it or not. Meanwhile, Sarah and Ali embark on two different approaches to connecting to their spirituality. Sarah creates an East Side religious movement, but discovers that her own narcissism gets the best of her. Ali starts to have nitrous induced visions, causing her to question her career path and her relationship with Leslie. And Josh, disengaged from work and love, suffers from a harrowing loss that forces him to reconcile with his past once and for all. All paths converge on a family cruise to Mexico, affirming that though their family history is murky, each Pfefferman is their truest self when they come together. The show also stars Judith Light, Gaby Hoffmann, Jay Duplass, Kathryn Hahn and Amy Landecker. 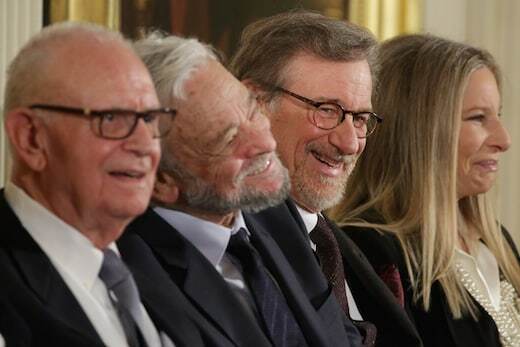 Two days before Thanksgiving, theatre legend Stephen Sondheim, Steven Spielberg, and Barbra Streisand were honored with Presidential Medals of Freedom at the White House. Spielberg's newest addition to his trophy case, anointed by the POTUS in the same way that Olympians celebrate their victories. As he left the ceremony, the President mimicked Elliott on the bike as the U.S. Marine Band played the theme from Spielberg's "E.T." Gloria and Emilio Estefan were also among the holiday honorees. The day before, the White House screened episodes of "Transparent" and the awards-contending "The Danish Girl" as part of a new initiative of "White House LGBT Artists Champions of Change." Jeffrey Tambor, Alicia Vikander and Tom Hooper at Focus' D.C. premiere of "The Danish Girl" later that night, just 9 blocks down Pennsylvania Avenue. Former and hopeful future White House resident Hillary Clinton mixed with Hollywood on the road, giving the opening remarks at AOL's "Makers: Once and For All," a documentary about the landmark women's rights conference in Beijing in 1995, which then-first lady HRC attended and addressed. Outside the Beltway, Meryl Streep, Adele, Diddy and Robert Pattinson lit up the party scene. Backstage at the AMA's, Harry Styles dodged a foreign outlet's microphone while signing a giant gold record in a smart promotion for Cross pens. Meredith Viera and Meryl Streep toasted Christopher and Dana Reeve's 25th Anniversary "Magical Evening" in New York. Back in Hollywood, one of the final pre-Thanksgiving industry gatherings honored Sony Pictures TV's President Steve Mosko (2nd from left) for the Saban Community Clinic. Fellow TV Presidents included (from left), ABC's Ben Sherwood, Showtime's David Nevins, on-top-of-the-world Netflix chief Ted Sarandos, and uber-social WME TV agent, Richard Weitz. Nate Reuss (of "We Are Young" fame) performed at the Beverly Hilton event. Haim Saban (right) gave a matching gift to raise the night's total to $3.2 million. Outgoing "Soup" host Joel McHale hosted a room that included Lizzy Caplan and event organizers Tom Hoberman, Nancy Dubuc and Mark Lazarus. LACMA's surprise "Live Read" series never disappoints. The Nov. 19 table read of "Network" cast Tony Goldwyn, Minnie Driver, Nick Kroll, and Aaron Sorkin to step into roles from the 1976 classic. Rene Russo lead the way at the Associates for Breast and Prostate Cancer "Talk of the Town" gala at the Beverly Hilton. From left, Honorees Dr. Richard Wright and Russo with ABCs President Gloria Gebbia and Patrick Wayne (the son of John Wayne, who runs the John Wayne Cancer Institute). Adele kickstarted her record-breaking week with an iHeartRadio performance at Joe's Pub in NYC, the site of her album launch in 2008 when she was an unknown. The audience sang along to "Someone Like You." iHeartMedia President John Sykes has reason to smile. A cross-generational, cross-quadrant unicorn like Adele raises all radio station boats. ...who knows how to host. Fab skipped over the cocktails, and handed out entire bottles of bubbly. This man is a microphone magnet. The "Can't Hardly Wait" cast had a reunion screening to benefit the Art of Elysium at the Samsung Studio LA on Fairfax. Here they are now: Steve Monroe, Jay Paulson, Joel Michaely, Peter Facinelli, Ethan Embry, Jenna Elfman, Eric Balfour, Sean Patrick Thomas and Jennifer Lyons. Ethan Embry, Sunny Mabrey, and Peter Facinelli showed their kids footage from their wild and younger Hollywood days. Jared Leto escaped to Cabo for the growing November film festival to our south. "Barry's Bootcamp" devotee Katie Holmes came to support pal Joey Gonzalez as he opened the new Hollywood camp. Without Thanksgiving as the starting line, Burberry chief Christopher Bailey (right) kicked off the Christmas season early at Claridge's in London, with party fixture Lily James. Burberry's holiday themed "Festive Film" tied to the 15th anniversary of Billy Elliot has already racked up an impressive 5.9 million views. Babyface EDM sensations Martin Garrix and Zedd (right) made it a date to link up in Amsterdam with fellow musician Eric Rudyak (center) before Saturday night shows. Shaun Robinson and Holly Robinson Peete flank Girls Lounge founder Shelly Zalis at the group's luncheon and awards on Nov. 18 at the Beverly Hilton. Before Justin Bieber roamed the hall of the Montage this week (the site of TheWrap's The Grill conference), Robert Pattinson and FKA Twigs filled seats at the 8th Annual GO Campaign Gala at the Beverly Hills hotel. On the awards front, Ian KcKellen has been campaigning hard for "Mr. Holmes." One of the many Governors Awards weekend events was a brunch in his honor at the British Consul General's Residence in Hancock Park. Life is Good founder John Jacobs, Gloria Steinem and Jessica Alba visited the city of brotherly love for an event called "The Pennsylvania Conference for Women" on Nov. 19. Jeff Probst has made a special outreach for organ donation this fall, both on CBS and off air after the issue came to the forefront for cast member Terry Dietz and his family. Probst traveled to Dallas as the guest of honor for "Taylor's Gift," an organ donation benefit. Before Art Basel ramps up in Miami, Zoe Kravitz and pal Twin Shadow shared the stage at the Thompson Miami Beach to celebrate the hotel's 1st anniversary. Greg Berlanti and WBTV President Peter Roth flank Debra Birnbaum before the Paley Media Council's Dialogue with the two WBTV powerhouses at the Paley Center in Beverly Hills. "This is the most important film of 2015," Tim Robbins tweeted of "We Are Many," a doc about the Iraq War protest. Robbins and "We are Many" director Amir Amirani at the Landmark on the westside. The anti-war film opens for a week each in NYC and LA in December. Leslie Knope would be proud that local politics reaches the 310. The CW's "Crazy Ex-Girlfriend" got a key to the industry-adjacent city of West Covina on Nov. 17. There to accept: CW EVP Thom Sherman, Co-Creator of Crazy Ex-Girlfriend Aline Brosh McKenna, West Covina Mayor Fredrick Sykes and cast Donna Lynne Champlin and Vincent Rodriguez III. Samantha Ronson crowded the decks for Tyga's birthday party at 1Oak on Sunset.